I know there are a lot of posts in regards to cages. I am leaning to the Madagascar. However, does anybody know of a cage about the same size with horizontal bars instead of them being vertical? I have that it doesn't matter if the bars are horizontal or vertical but I would think the horizontal bars would be more pleasing and easier for them to grasp. This may or may not help . . . But I'll tell you my story, because the beginning sounds an awful lot like yours. I wanted a nice big cage. I also wanted horizontal bars. The Madagascar had the size but not the horizontal bars. The Critter Nation cage had size & horizontal bars, but I couldn't get past the interior drop tray. Even if I cleaned it every morning, half the night he'd be stepping in his own mess & tracking it around. It seemed altogether less clean than I wanted. There is a way to modify it to have the drop tray under the bottom grate of the cage & a few members here have the Critter Nation cage & have made those modifications but I couldn't for the life of me figure out quite how they were doing it. Also, those who praise the Critter Nation cage love that it lends itself to easy expansion. So while I think the answer to the question as you asked it is Critter Nation! Amazon! A little over $200. My story ended a little differently, though. Every option seemed to be a compromise & I'm not financially stable enough to be willing to spend $200 on something that's *almost* perfect. So I found a link buried away in the depths of Glider Central on how to build my own cage. It had the size, & it's made of pvc & hardware mesh so it's easy to climb & will never rust, which can poison your gliders if the rust goes unnoticed &/or un-remedied. It's a little bit of work but it's less expensive & has many more pros than cons. I'm very happy with it. Here's the link I used for you to look at & see if you're interested in going that route rather than the Critter Nation cage, but if you decide to make the cage, let me know here or in PM if I don't see it & I'll give you some info that wasn't in the instructions so you don't hit the same snags I did. Also that extra mesh is great for making cage accessories. Last edited by Nstromo; 07/07/16 02:03 PM. Thank you....I was thinking about the PVC cage as well but my female is a chewer....I am afraid of her chewing the mesh. Any problems with that that you have encountered? Is it pretty easy to do repairs if need be? And yes, I am interested in your help with the hopes of snag free along my way. Thank you for your response. Delta nibbles a bit, but I wouldn't call him a chewer so it's hard for me to weigh in on that. The mesh seems fairly sturdy to me, but again that is pretty relative to how your girl chews. I haven't had to do any repairs yet, but my guess is that they would not be easy. I suspect a patchwork would leave sharp zip tie ends within reach of little paws. I think if you could tighten them to the point that they wouldn't spin so the sharp bit was pointed in, it would stress/warp the mesh. I would think a repair would entail replacing an entire panel. I would test the mesh against your girl's teeth first. But I've only seen it sold in massive quantities. If you like, I could whip up a little tube & send it to you to hang in your current cage, or I'll bet you could find a trusted vendor that has something for sale made with the same stuff. If she doesn't chew through it, you can be sure. The DIY cage may be cheapER, but it's not *cheap. * Not worth guessing in my opinion. My babies have been in vertical barred cages since I had them, and the girls I know for a fact all of their lives. I can't be too sure of my Ollie boy, because he was around 4 when I homed him. I do know that he spent some time with the mom previous to me in a vertical bar cage and also a mesh/screened cage (similar to Glide-Ariums). 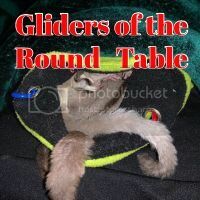 None of my gliders have shown any discomfort or ill effects from living in vertical barred cages. I personally have had the trio in a Madagascar cage and it was a very nice cage. Currently, my gliders are in an HQ Lrg. Sturdy cage, also a very nice cage so far. If and when I need to replace their cage, I may consider the CN or All Living things, if the space and budget allows, and modifications for drop pan are still possible, due to the fact of expansion options. However, I do not rule out the possibility of other options being considered as well when/if the time comes. I knew Terry would be here before long. And I trust her a lot. My stubborn attachment to horizontal footholds was likely to be just that. Stubbornness. Like giving him bottled instead of filtered water. Makes *me* feel better. Thanks for weighing in, Terry!! I understand stubborn obsessions, I have a few of those myself, lol. Thank you both so much. I guess we worry so much in whether we are making the right decision or not. Worry is healthy with a life in your hands. You'll be a wonderful glider parent. Zip ties can be hazardous if not clipped correctly. I use them in my work (telecommunications) daily and have learned the correct way to cut them. They are hazardous to humans too. There are 2 ways to properly cut them. One would be to get your scissors level and cut it off evenly, or once the tie is where you want and tight, twist the end nearest where it will be cut tightly, and cut straight across. You can also use a lighter and carefully burn the sharp edge on existing zip ties, care ful not to catch them on fire. Practice with this method is a great idea. I use smaller softer zip ties for my fuzzbuts stuff so I don't have to worry about sharp ends. Yes! That's one of the things NOT mentioned in the instructions. I didn't even know there was a correct way to cut them to keep them from being sharp! I used the lighter method, it's something I've had to do before building a set where safety could be the difference between smooth sailing & a lawsuit. I still pointed the ends out of the cage & covered the ends that were readily accessible with fleece. And I keep an eye out for sharp spots being created by chewing, but Delta doesn't chew much. Still, can you share a link or brand name of the zip ties you use? Those things are my least favorite thing about that cage.